After the holidays, the fridge is usually filled up with leftover meats, vegetables, bibs and bobs. The best way to empty the fridge and not throw away leftover food is to throw it all in a big pot of soup. The chicken broth will improve your nutrient and mineral intake. It contains collagen and amino acids that help repair damaged intestinal lining that lead to digestive issues (diarrhea, bloating, constipation etc) . 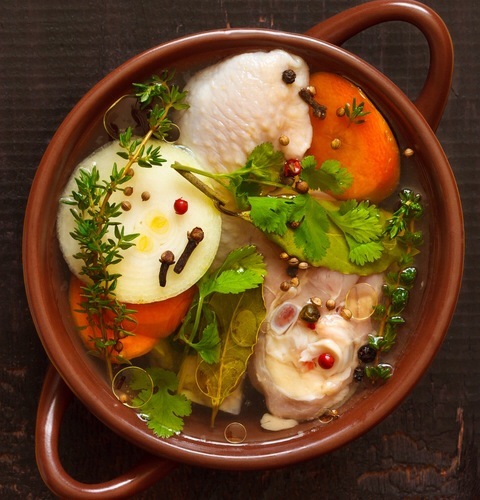 It has been found that chicken broth can increase the number of white blood cells, which will make you more resilient to colds and infections. By cooking down the bones, you’ve also got the perfect recipe of vitamins and minerals to repair your own bones: calcium, magnesium, phosphorous and zinc. In a medium pot on medium heat, add olive oil to warm. Place grated ginger in hand and squeeze over pot to release juice. Discard spent ginger. Add broth and pastina and stir. Cook until pastina has softened.